How Can Your 501(c)(3) Organization Mobilize Voters in 2018? As the 2018 midterm elections approach, many nonprofits are wondering how they can mobilize their communities to vote. Nonpartisan voter registration drives and get-out-the-vote (GOTV) campaigns are two ways 501(c)(3) public charities can empower their communities to actively participate in elections. By engaging voters, nonprofits help communities become active in the electoral process and ensure that their voices and concerns are heard by their representatives, candidates, and government. While 501(c)(3) public charities are not allowed to engage in partisan political activity, they can carry out voter registration drives and GOTV campaigns that are strictly nonpartisan. In other words, 501(c)(3)s may encourage community members to vote, as long as that effort does not support or oppose candidates, or political parties. The following are examples of best practices for mobilizing voters, with examples of efforts by amazing organizations that are increasing voter participation in their communities while remaining nonpartisan. For more in-depth information on nonprofits and voter engagement, see Bolder Advocacy’s The Rules of the Game: A Guide to Election-Related Activities for 501(c)(3) Organizations. Focus on clients or community members with whom your organization already works. AltaMed is one of the nation’s largest community health networks and one of the few nonprofit healthcare providers committed to engaging patients in the electoral process. AltaMed focuses its voter registration drives and its GOTV campaigns on its patients. AltaMed engages patients by calling them with targeted GOTV messaging, and by simply offering patients voter registration forms at the check-in desk. Why would a healthcare provider engage in voter registration and GOTV campaigns? AltaMed believes that by focusing on the people AltaMed already serves, it can raise the voices of underserved and underrepresented communities that are often excluded from important decisions. This is all achieved without supporting or opposing candidates, or political parties. Concentrate on the demographic populations your organization already engages in its programs or advocacy. NNAAC’s mission is to empower the Arab American community through advocacy, civic engagement, capacity building of member organizations, and promotion of youth leadership. NNAAC also focuses on engaging the Arab American community of Dearborn, Michigan in the electoral process. 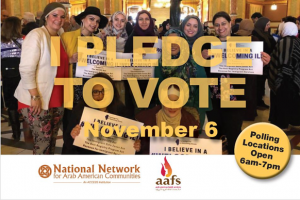 NNAAC’s target community for its GOTV campaign is Arab Americans between the ages of 18 to 35, who seldom or never vote. 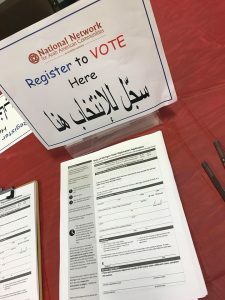 As Isra Daraiseh, NNAAC Program Coordinator, noted, “We meet the community where they are.” NNAAC conducts voter registration drives at local mosques, high schools, and grocery stores where they are likely to connect with Arab American community members. By focusing on voter engagement of Arab American communities, NNAAC hopes that the community can trust NNAAC and will turn to it with any questions concerning the electoral process, voter registration, and voter protection. When Arab Americans have a greater voice in the electoral process, they can mobilize to fight for a more equal and just society. By focusing its outreach on the population it was created to serve, NNAAC keeps its voter engagement efforts aligned with its mission. Engage community members in neighborhoods where your staff and volunteers live, or where your organization’s offices are located. Chinese Progressive Association of San Francisco (CPA) is a 501(c)(3) public charity that seeks to empower the Chinese American community. CPA’s office is located right in San Francisco’s Chinatown, and their voter engagement campaign is geographically based there, too. 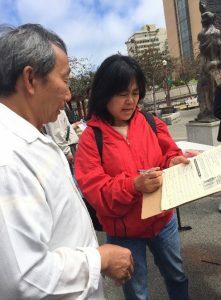 CPA focuses on engaging voters in low-income Chinese immigrant communities in San Francisco. CPA achieves this by talking to community members about the organization’s public policy priorities, such as repealing laws that limit rent control, advocating for affordable housing, and funding homeless services. 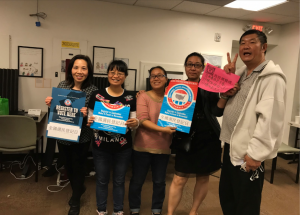 CPA’s voter participation campaign involves not only registering voters, but also making sure registered voters in Chinatown and across the city cast their ballots. Then CPA mobilizes voters to continue engaging in the public policy arena. CPA conducts its outreach from its offices in Chinatown. That way, CPA can directly speak to the community at bus stops, on the streets of San Francisco’s Chinatown, or through local media channels that reach the Chinese American community. These organizations provide great examples of best practices for conducting the important and necessary work of voter registration and get-out-the-vote. These 501(c)(3)s focus on clients whom they already serve, community populations they are designed to engage, and community members living in neighborhoods where the organization’s office is located. Of course, this is not an exhaustive list of tips to keep your 501(c)(3) voter engagement efforts nonpartisan, but Bolder Advocacy is here to help. Feel free to contact our technical assistance hotline at 866-NP-LOBBY or [email protected]. Let’s advocate even more boldly this election year! 501(c)(3) public charities and private foundations may engage in get-out-the-vote efforts. 501(c)(3) public charities, including community foundations, may engage in nonpartisan voter registration. 501(c)(3) private foundations that want to engage in voter registration may do so, as long as they follow certain rules. See Voter Registration Rules for Private Foundations for more information. Voter Registration drives and GOTV campaigns must also abide by state laws.